There are hundreds of video codecs, and each of them has different usage models, so you may need to download a video codec converter to convert one codec to another, for example, convert H.265 to H.264 that works well on most mobile devices, PCs, media players. Things will get a bit confusing if you try to understand how these codecs work and their advantages and disadvantages. We put things simply here, let's look at how to choose a video codec converter since many video codec converting applications are out there, ranging from free online video converters, open source ones to professional-grade programs, then give a good video codec converter as an example, and discuss video codecs and container format later. We've mentioned there're hundreds of video codecs, so a good video codec converter should accept whatever video codec you throw at and output the codec you want. When you are looking for open source free video codec converters, make sure they support at least some popular video codecs such as Xvid, DivX, H.264, MPEG-4, VP8, VP9, Theora and audio codecs AAC, MP3, Vorbis, WMA. The video codec conversion process involves codec decoding and encoding with another new codec, which always reduces the quality of the video. Bear in mind that it's a trade-off you have to face between video quality and file size when converting video codecs. But professional video codecs converter can minimize quality decrease and meantime offer acceptable size. "I'm using Handbrake to encode VP9 video, but it really takes much time, estimated around 7 hrs. Is this normal?" It would be a headache if it takes a few hours to change video codecs. Speed really matters when choosing a video codec converter, especially a free video converter. 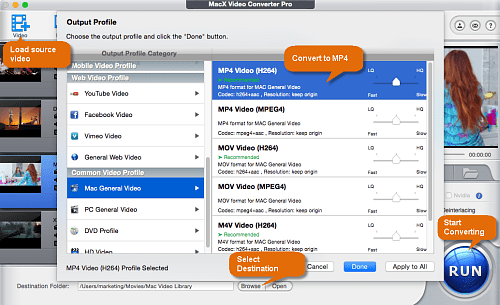 MacXDVD Software's MacX Video Converter Pro are among the best video codec converters we tested. The well-received converter supports over 370 video audio codecs, enabling you to convert nearly any video codecs, for example, H265 to H264, decode/encode VP9, DivX to MPEG 4 and others. High Quality Engine is embedded into the best video codec converter and guarantees nearly no quality loss when processing video codec conversion. Multi-core CPU (up to 8 cores), hardware acceleration and HT tech makes it the fastest video codec converting software, at least 5x faster than others. The video codec converter is very easy to use. To change video codec, just add source file, choose output codec you want and start processing. Free download the video codec converter for macOS (macOS Mojave also incl.) or download Windows version (Win 10 also supported), run it on your computer and follow steps below to start with. Step 1: Click "Add File" button at the top left corner and select source file you'd like to convert. Or simply drag and drop the file. Step 2: Choose output codec and container format. The video codec converter offers 420+ preset profiles covering iPhone, iPad, Android PSP Samsung, smart TV, YouTube, FaceBook etc. which makes things much easier if you are confused about what codec to choose from. It is also suitable for video parameters adjusting, like video resolution, bit rate, frame rate, audio bit rate, channel and much more. Step 3: Click "Browse" to select a destination folder to save output files. Then click "RUN" to start to change video codec on. When you change video codec, you have to select the best video codec to meet your needs. We list the most popular video codecs here and give a brief comparison in size and quality for your reference. H.264: H.264 gives good compression performance - high compression ratio and high quality. It is compatible with most mobile devices and suitable for online video streaming. But H.264 is not the best codec for 4K UHD and 8K Full HD content. H.265: compared with H.264, H.265(HEVC) is better than H.264 at compression. H.265 is popular for 4K UHD and 8K data. But you may need to convert H.265 video codec to another codec like H.264 or MPEG4 etc. to solve compatibility issues. MPEG 4: MPEG 4 video encoding is very flexible and it is accepted by mobile devices. MPEG 4 vs H.264, the latter is better in compression performance. DivX: the best codec for Galaxy smartphone, Xbox 360 and Sony PlayStation 3. Video codec is not a video format. The codec is a compression standard responsible for encoding and decoding video streams. Codecs are used to compress(encode) video size and then decompress(decode) it when needed. Most popular video codecs include H.264, H.265, MPEG, MPEG-1, MPEG-2, MPEG-4, VP8, VP9, DivX, XviD and others. Different video codecs are for different intended uses, that's why a video codec converting software is needed from time to time. A container format stores video codec, audio codec and other data, for example, subtitles, chapter information, into one package. A container format can contain different types of codecs. An MP4 format can be encoded with H.264 or MPEG-4 video codec, and MP3 or AAC audio codec or others. The most popular container formats are MP4, AVI, MKV, FLV, to name a few. The above video codec converter also works as the best video converter that is able to convert among HD/SD video formats, such as MKV to MP4, FLV to AVI, WMV to MOV, MP4 to MP3, AVI to MP4, to name a few. What are the differences between H.265 and H.264? This H.264 vs H.265 comparison shows you how H.265 advantages over H.264 in bandwidth, file size and quality, and how to switch between H.264 and H.265 with a video codec converter. H.264 VS MPEG4, confused about what codec to choose when changing video codecs? Don't worry, this tutorial will explain the difference between H.264 video codec and MPEG4 video codec. Here's a brief comparison between MKV and MP4 container formats to help you choose the right container format that suits your needs better during video (codec) conversion. Free download the best video codec converter - MacX Video Converter Pro to quickly convert any video codecs on macOS and Windows, such as H.265 to H.264, DivX to MPEG-4, with original quality reserved in 5x faster speed than other free video codecs converters like Handbrake. Change Video Quality through Resolution, Bitrate etc.